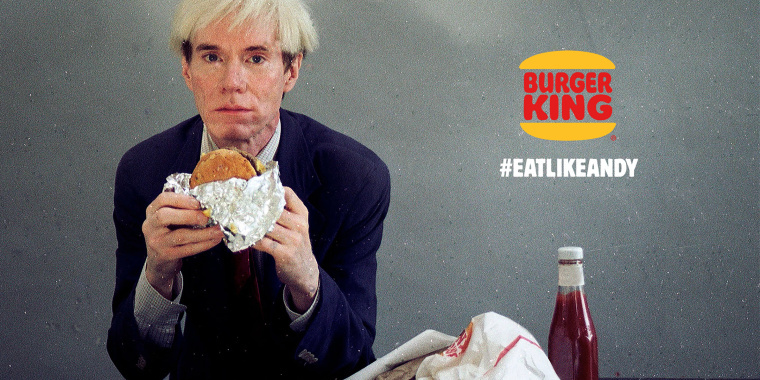 What happened in Burger King's Super Bowl commercial with Andy Warhol? Did anyone else just watch Burger King's Super Bowl LIII commercial waiting for a dramatic ending that never came? You're not alone. The burger chain has become increasingly edgy in recent marketing campaigns, from advertising its delivery service with actual car accidents to throwing some pretty fierce jabs at its largest competitor, McDonald's. In January, the King even created a copycat Big Mac and let customers use collectible McDonald's coins to pay for it. But in the commercial that just aired during the fourth quarter of the Super Bowl, nothing (not even a flame-grilled burger) sizzled, blew up or did anything to provoke a little laughter — like most big budget commercials that air during the game. In fact, aside from the crinkling of a fast food bag at the top of the spot and a little rustling of the burger's wrapper, there's barely any noise at all. Burger King decided to show a different, more avant-garde side of its personality. And it used one of America's most iconic artists, Andy Warhol, to do it. Warhol, a legendary painter, sculptor and filmmaker, is widely considered to be one of the most preeminent figures in the pop art movement. Countless A-listers — and a very famous can of soup — served as subjects for Warhol throughout his prolific career, from Marilyn Monroe to Blondie and Elvis Presley. But Warhol passed away in 1987. So what's the real deal with the brand new commercial? This, Burger King announced, is what it wants its customers to know: Whoppers are for everybody — the wealthy, the famous, the poor, the athletes and the artists. The new commercial — which simply shows Warhol unwrapping a burger, adding a little ketchup and eating it — was actually 37 years in the making. Originally filmed by Danish director Jorgen Leth in 1982 for a film “66 Scenes from America," the clip was meant to highlight different aspects of the modern American society. One of the film's scenes included a 4-minute short of Warhol silently removing a Whopper from a (now vintage) Burger King bag and eating it. Burger King recently secured approval to use the footage for the ad from the Andy Warhol Foundation. "The spot is meant to break through the traditional Super Bowl commercial break, filled with explosions, slapstick jokes and celebrities, with an almost silent, yet powerful work of art," Burger King said in press statement. So, naturally, it was only a matter of time (nearly four decades, to be exact) until Burger King had to repurpose fine art into an ad to continue the cycle of commercialism. Before the Super Bowl, the company promoted an #EatLikeAndy Mystery Box deal, available through the delivery service DoorDash, during the week leading up to Feb. 2. Many of the customers who ordered it are probably saying: "Ah, I finally get it!" right about now. The Mystery Boxes were delivered over Super Bowl weekend and contained a vintage-looking Burger King paper bag, a white wig resembling Warhol’s signature haircut, one ketchup bottle and a DoorDash coupon for a free Whopper.